Letter writers offer advice to White Rock leaders’ concerns over FOI requests. Re: FOI requests add up, says Mayor Baldwin, Nov. 16. 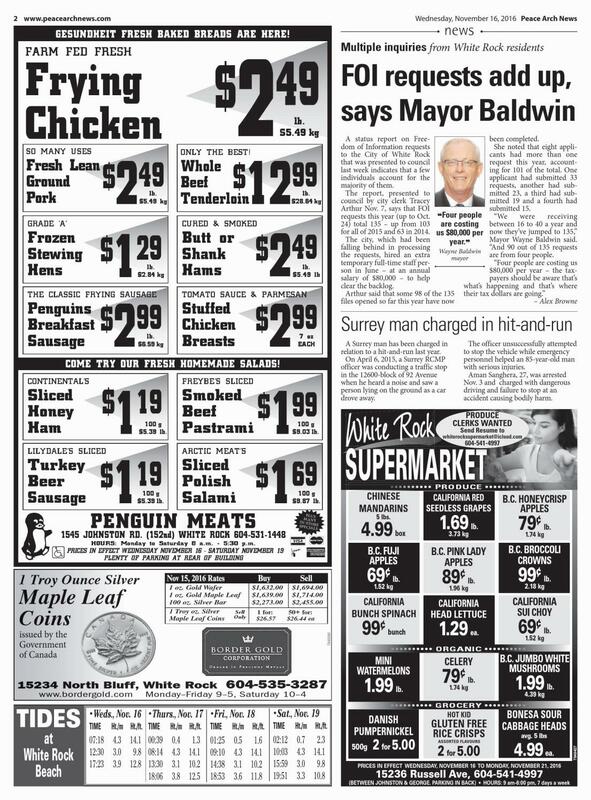 This article, tucked in amongst the ads on page 2 of PAN, shows a new low in the approach Mayor Wayne Baldwin is sinking to in an attempt to vilify those who have taken steps to shine a light on the ways this administration is trying hide things from public scrutiny – let’s go after all those annoying people who ask embarrassing questions by first picking on a few of them. There are many citizens who are appreciative of those few who tirelessly hold the feet of city council and its employees to the fire of public scrutiny of their actions. Learning the intricacies of how to make FOI requests is not a simple matter, and many are pleased their neighbours have taken on that task. Following up on requests requires tenacity and resources beyond the average citizen’s capability. The city has seen fit to pay an individual $80,000 a year – almost $40 an hour – to field these requests. Imagine if all the people asking these questions and those who support them were to submit a bill of similar proportions for their work. These people represent countless individuals whose annual income is much less than the city pays but are legitimately interested in knowing why their tax dollars are being spent. The city website acknowledges it processes some 221 different requests/reports and, of these, fully 117, more than half, are withheld from public view and criticism. The only hope to access them is by an FOI submission. If the mayor wants to reduce the perceived burden, all he has to do is institute a more open-to-the-public, democratic regime. It is true the number of FOI requests has risen, but this is a result of the increased number of in-camera meetings, no-questions-permitted and other muzzling and closed-to-public-scrutiny activities that this administration has instituted. Start behaving like you truly believe your job is to represent all citizens, Mayor Baldwin, and the number will go back down. Once again, blame for costing White Rock taxpayers $80,000 is being laid at the feet of four people wanting information about what is going on in their community. Perhaps instead of blaming these folk for requesting the info they deserve, mayor and council should be more forthcoming with such information and hold less closed-door and in-camera sessions. Democracy is often slow and tedious – not to mention expensive – but it demands respect for everyone, and that includes information sharing. Incredible are the revelations of Mayor Wayne Baldwin speaking to the large increase in FOI requests. A lot of animosity exists regarding the transparency and accountability of both the current mayor and council to the citizens of White Rock as a whole. When much is cloaked by excessive in-camera meetings and secrecy, it is clear that to obtain the facts of issues and information, the FOI process is the only option. It is sad to see officials operate under such a repressive regime as the current mayor and some members of council demonstrate. It must be more than a challenge that the designated FOI person and files are several feet from the mayor’s office. The FOI department should be moved to an independent work space environment to avoid any work political conflict, actual or perceived. The FOI officer that I have dealt with infrequently over the years fully understands the legislation and does an excellent job. In past years, the FOI officer was extremely competent and can handle easily the normal FOI flow of requests. If this FOI officer is now receiving more requests than in recent years, it is for the tragic reason that both mayor and council as a whole are not transparent and not trusted by citizens and developers alike. Mayor Wayne Baldwin tries to blame members of the public for increasing high costs of fulfilling freedom-of-information requests by $80,000 a year. A simple solution would be to replace the secrecy games with some transparency. It is unacceptable for the public to be required to both initiate then wait years for this information. I watched with amusement as White Rock Couns. Megan Knight and Lynne Sinclair – along with the mayor – tried to make a case for their faux indignation regarding too many FOI requests and the threat they are to the city’s policy of suppression of information. Here, we have a perfect example. Looking at the list of routinely released information, I was struck by the fact that salaries are routinely released. Then why, when a request was made to the director of financial services for the base salaries for exempt employees for the years 2013-’15, why was I directed, after a prolonged wait, that these would have to be FOI requests? This has happened several times, according to the list in the corporate report. Ultimately, the freedom-of-information clerk relayed that I would have to pay a fee, as there was just too much work involved and the director of financial services had said it would be very time-consuming. I cut down the list to accommodate the apparently excessive amount of time. A week after the date of response passed, I contacted the FOI clerk again, and within an hour the temporary FOI clerk transmitted a response. I have no sympathy for the ruminations of the council members, as it is apparent city staff are dragging the process out and causing FOI applicants to ask for reviews from the Office of the Information and Privacy Commissioner. I find it highly suspect that council members would challenge the democratic process of information release, which is mandated by a law on the basis of there are individuals that are scrutinizing the lack of openness and transparency which this administration holds so dear to its heart and daily operations. I suggest they clean up their act before trying to demonize regular citizens exercising their democratic and constitutional rights. The mayor is carping about how four citizens are costing $80,000 dollars in FOI requests. Great pay for an administrative assistant normally paid $15 per hour or less in the private sector. Perhaps His Worship would like to explain, why, in this digital age of 24/7 connectivity, our council business is conducted behind closed doors on many occasions, with many only given to the taxpayers when an FOI request is made? It’s 2016 now, and for a one-time cost of a few thousand dollars, audio-visual equipment and data storage could be set up to record all meetings, negotiations and other municipal business so the bill payers that elected them to manage their business could log on and see and hear what is actually taking place. It’s public business and should be conducted openly with full, immediate and unedited access to the information, no application required. I’m patiently waiting for His Worship to release the details of the city agreeing to pay Epcor $30 million-plus for the water utility, plus another $20 million-plus to upgrade the existing utility, not to mention the ever-increasing and ongoing annual cost of maintaining the utility, when they could have tied into the Metro Vancouver supply for $22 million or less. Could it be that council has hired John Grisham to write the spin?